MEXICO CITY (AP) — Mexico's president-elect said Oct. 29, he will respect the result of a referendum that rejected a partly built new airport for Mexico City, effectively ending the $13 billion project. "The decision taken by the citizens is democratic, rational and efficient," Andres Manuel Lopez Obrador said after 70 percent voted against the plan. "The people decided." Organizers of the referendum reported late Oct. 28, that just over 1 million people voted in the referendum. The vote has been criticized in part because only about one of every 90 registered Mexican voters participated. Mexico's peso slid more than 3 percent against the U.S. dollar after the decision was made public, with the interbank rate ending at 20.06 pesos to $1. Banco BASE said it was the biggest single-day drop since Nov. 9, 2016, when markets reacted to Donald Trump's election as U.S. president the day before. The fall wiped out all the peso's gains this year. The Mexican stock exchange's IPC index ended the day down 4.2 percent. Critics of the cancellation had said it might affect investor confidence in Mexico, but Lopez Obrador said investors, debt holders and contractors in the abandoned project will be protected. Lopez Obrador pledged during his campaign to cancel the Texcoco project, claiming it was marred by overspending and corruption. After winning, he said the issue should be put before Mexican citizens. He favors adding two commercial runways to a military air base in the town of Santa Lucia, about 28 mi. from the capital. That would imply an improved road to get there from Mexico City and the current 1940s-era airport. The city's airport is now working at near capacity and would have been closed had Texcoco been built. Lopez Obrador said he has received assurances from international experts that the current airport and Santa Lucia could operate simultaneously. 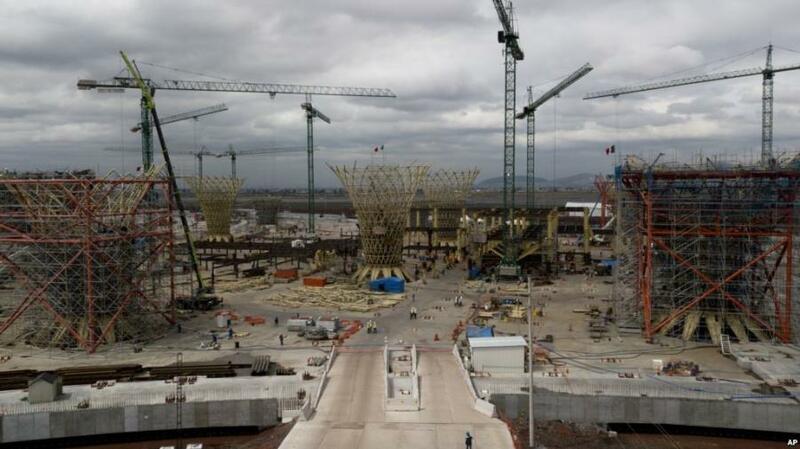 Still, given the distances between the current airport, the planned Santa Lucia terminal and an existing satellite airport in the nearby city of Toluca, it is unclear how people could make connecting flights within any reasonable amount of time. The president-elect said Mexicans will save about $5 billion by abandoning the unfinished Texcoco project, which was started with what critics said was little real environmental study by current President Enrique Pena Nieto, who leaves office Dec. 1. Pena Nieto said later Oct. 29, that his government respects whatever decision Lopez Obrador may make once president, but construction will go ahead until Nov. 30, to meet obligations under bonds that were issued to finance the project. He warned that if the airport is canceled, it could cost taxpayers. "It is anticipated that ultimately there would have to be prepayment of bonds issued to finance this project, and probably this will demand fiscal resources additional to" existing funding currently being collected through an airport tax, he said. It was supposed to be the signature infrastructure project of Pena Nieto's administration, though it wouldn't have been finished for several years more. But the outgoing administration was marked by corruption and allegations of insider dealing with contractors, which helped propel Lopez Obrador to the presidency July 1. The referendum held Oct. 25 to 28, marked the first time such a large project had been submitted to a public debate and vote. Lopez Obrador said the decision meant "corruption has ended." Mexico's business community, which overwhelmingly supported the now-cancelled project, questioned the referendum, which they said was unofficial, unrepresentative and biased. Juan Pablo Castanon, the head of Mexico's Business Coordinating Council, an industry group, fiercely criticized Lopez Obrador's decision to obey the vote, saying it "seriously hurts Mexico's image in the world" and "sends a message of uncertainty" to financial markets. Some questioned whether such a decision, involving complex issues of air traffic control, should be decided in a referendum. The national Confederation of Chambers of Commerce wrote that "it should be a technical and financial decision, not a political one, based on a popular vote." Lopez Obrador called the decision "a triumph for the environmental movement," saying the Texcoco project threatened to eliminate the last remaining vestiges of lakes that once covered the Valley of Mexico. Lake Nabor Carrillo had become a refuge for migratory birds but was too close to the Texcoco site and would have posed a threat of birds hitting jet engines. However, much of the environmental destruction associated with the Texcoco project is already done. Millions of tons of rock were quarried in nearby towns and transported to the site to fill and drain the swampy former lake bed. Lopez Obrador said he hoped the unfinished site could be used to create "a big sports and ecological center for Mexico City."